We want this section of our site to give you a glimpse into the lifestyle of Symbari Somalis. 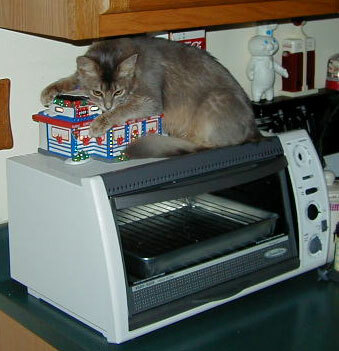 Somalis are very active cats when they are not sleeping, so we try to keep them entertained in various ways. They like to watch tv, chitter at the birds at the birdfeeder just outside the window, try to catch the fish in the aquarium through the glass, eat, eat and eat some more. They have lots of toys but love a good cardboard box every now and then. They also love running water and like drinking from the faucet. All in all Somalis love life and deserve to live it to the fullest. 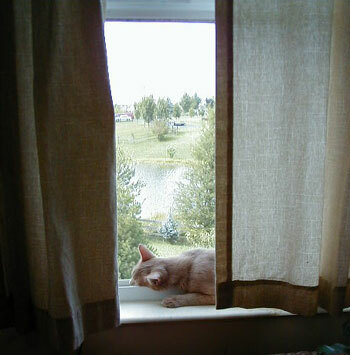 Enjoying the view or sleeping? 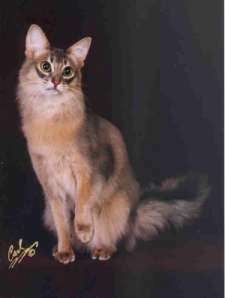 The Somali is a longhaired Abyssinian, originating as an undesirable product of a recessive gene in the Abyssinian cat. 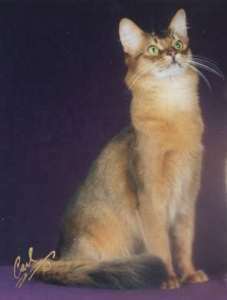 In early years, the Somali was not held in high regard; Abyssinian breeders were appalled to find these fuzzy kittens popping up in their litters, especially after all the hard work they had put into line breeding to "fix type," working with their imported English Abys. These longhaired kittens were petted out or otherwise "swept under the carpet," and many Aby breeders refused to even admit having them. n 1963, CCA Allbreed Judge Ken McGill was asked to judge a show in Calgary, Alberta, Canada. 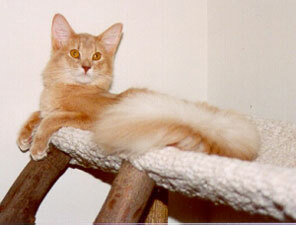 As a practical joke, Aby breeder Mary Mailing put a longhaired Aby in the cage amongst the class of Abys. Ken took out the cat, looked down to describe how the cat fit the standard, and was surprised to see the longhaired Aby in his hands. The exhibitors had a good laugh, but Ken was so taken with this beautiful cat that he asked Mary for one to breed. 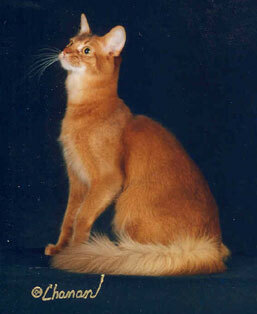 With this cat, Ken founded the oldest Somali line in Canada. About the same time in the United States, Evelyn Mague began working with Somalis, after finding that two of her Abys carried the longhair gene, Lynn-Lee's Lord Dublin and Lo-Mi-R Trill By. She and a friend had bred the two and produced a dark fuzzy kitten. Before Evelyn knew it, her friend had given the kitten away. Evelyn had been working with an animal welfare group, Cat Placement, and one day received a call from a woman who had developed an allergy to her cat. She brought it to Evelyn to place, and Evelyn found it to be the most beautiful cat she had ever seen. "George" turned out to be the very same longhaired kitten from the Lord Dublin x Trill By litter that had been given away. From that time on, Evelyn worked diligently for recognition and development of the Somali breed. Evelyn had the distinct honor of naming the breed with a bit of humor. Since some Aby breeders saw the Somali as an unwanted interloper, she picked a name of equal stature to the one derived from Abyssinia - she chose to call them Somalis after Somalia, the ancient neighboring country of Abyssinia. © 1993 by Bethany T. Tod, Tadofa Somalis. No part of this text may be reproduced without the prior written permission of the author and this copyright notice. While blue Somalis are beautiful cats, they also seem to find trouble a little more than their ruddy, red and fawn counterparts. Life with them is certainly full of activity. We wanted this little section of our site to offer a small glimpse of the trouble and fun that seems to find them, thus the title. The Coke diner is coming under attack!